Please join us for an important evening discussing free speech on Canadian Campuses in 2013. John Carpay, President of the Justice Centre for Constitutional Freedoms will be presenting the JCCF's new 2013 Campus Freedom Index. We will also have student speakers sharing their experiences across Canada with Free Speech Walls, and we'll have their walls in the foyer as well. 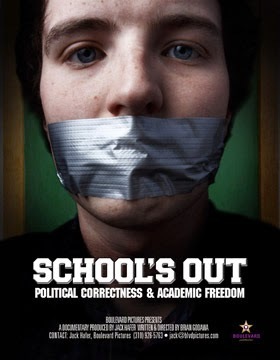 And, to make this an amazing night, we will be re-showing the film, "School's Out" about political correctness in schools in the United States. We'll also have a short film on free speech violations at Canadian Universities. After the films, please join us for a private reception. John Carpay, President of the Justice Centre for Constitutional Freedoms (JCCF) will be presenting the JCCF's new 2013 Campus Freedom Index. Find out which Canadians schools are the best and worst for free speech. And, to make this an amazing night, we will be re-showing the film, "School's Out" about political correctness in schools in the United States. Finally, after the film, please join us for a private reception. An Evening with Barbara Kay! Columnist at the National Post, Barbara Kay is a true Canadian treasure. In this event, Ms. Kay will read from her new book, Acknowledgements, discuss her work with Free Thinking Films President Fred Litwin, and then answer questions from the audience, followed by a private reception. Ms. Kay is a weekly columnist for National Post and a frequent contributor to the Post’s opinion blog, Full Comment. Her writings have also appeared in conservative U.S. online opinion sites Front Page Magazine and Pajamas Media, and in print magazines such as Canadian Observer, Dorchester Review and Cité libre. In 2009 Barbara was the National Association of Men’s recipient of its award of excellence “for promoting gender fairness in the media.” She is also a Woodrow Wilson Fellow. In 2012 Barbara received the Diamond Jubilee Medal for "excellence in journalism. Barbara is a regular guest on many Canadian radio talk shows, from the Maritimes to B.C., as well as more recently on Sunmedia TV. Barbara is the co-author, with Aruna Papp, of Unworthy Creature: A Punjabi Daughter’s Memoir of Honour, Shame and Love. "Barbara Kay’s writing is brisk and clear. She thinks for herself. She bravely resists the turn of the moment, and the preoccupations of the politically correct..."
"There’s one group, the best of a bad lot, columnists I call the cream of the crap… Then there are a few like Barbara Kay, who is good when compared to good writers, not bad ones. She started punditry at an age when some people retire from it. Perhaps that's why she isn’t one of those writers about whom you feel they’ve written more books than they’ve read. She is a chippy polemicist, but only tells readers who may disagree with her that they’re wrong, not that they’re small and stupid. Most writers know how to assert; some know how to demonstrate; but only the Barbara Kays of columnists have the capacity to persuade." Admission: $20 (Students, $10); film, remarks by Professor Jan Grabowski of the University of Ottawa, plus private reception. Tickets available at the door, and at Compact Music (785 Bank and 206 Bank). This film was given a special award at the Jerusalem Film Festival by the Yad Vashem Institute. Aftermath is a film based on one of the most controversial episodes in Poland's World War II history, the Jedwabne massacre of Jews by their Polish neighbours. Inspired by the 1942 tragedy in which hundreds of Jews were burned alive in a barn, an event long blamed on Nazi Germany, "Poklosie" ("Aftermath") was directed by Wladyslaw Pasikowski. "I wanted to tell a story that would interest a broad number of Poles because it is one of the most painful parts of our country's history," Pasikowski said recently. "We already have a huge number of films on the horrors committed by the Soviets and the Germans, and it's time to say what bad things we did ourselves." The director said he was inspired by "Neighbours", a book by Polish-origin US historian Jan Tomasz Gross, which sent shock-waves across Poland when it was published in 2000. Gross shed light on the role of local residents in the massacre in the eastern Polish village, sparking a bitter debate in Poland. According to various historians' estimates, between 340 and 1,500 Jews perished in the massacre. In 2003, a Polish commission of inquiry concluded that the massacre was perpetrated by Jedwabne's Poles, urged on by the Nazi occupiers, rather than by the latter, as long claimed. Pasikowski said he was also influenced by French director and Holocaust survivor Claude Lanzmann's 1985 work "Shoah", as well as the documentaries of Poland's Pawel Lozinski. His film is set in the 1990s, in the wake of the 1989 fall of Poland's post-war communist regime and shortly before the revelations about Jedwabne. Its message is that covering up the truth of the past can have terrible consequences decades later. Gao Zhisgheng is a human rights attorney in China known for defending activists and religious minorities and documenting human rights abuses. He has been disbarred and detained by the Chinese government several times, and severely tortured. He last disappeared in February 2009 and was unofficially detained until December 2011, when it was announced that he has now been imprisoned for three years. His commitment to defending his clients is influenced by his Christian beliefs and their tenets on morality and compassion. For more information please visit our website at www.freethinkingfilms.com. Fracknation follows journalists Phelim McAleer as he faces gun threats, malicious 911 calls and bogus lawsuits when questioning green extremists for the truth about fracking. Fracking is going to make America one of the world's leading energy producers but it has become the target of a concerted campaign by environmentalists who want it banned. In Fracknation, McAleer travels across the USA and Europe to uncover the science suppressed by environmental activists and ignored by much of the media. He talks with scientists and ordinary Americans who live in fracking areas and who tell him the truth about the exaggerations and misrepresentations of anti-fracking activists. "McAleer is an expert practitioner of cinematic jujitsu". This new documentary, written and presented by Danish Human Rights Lawyer Jacob Mchangama, focuses on one of the defining issues of our time; the global battle of values over the relationship between free speech and religious sensitivities. Recent years have seen increasing demands that free speech should be limited to respect religious feelings. In a globalized world this conflict has become explosive as cartoons published in Denmark and videos uploaded in America have led to violent riots from Cairo to Karachi. The outcome of this battle, says Mchangama, will have profound consequences for the ability of people everywhere to freely express themselves and follow their beliefs. Followed by a panel discussion with Jacob Mchangama and others. "Jacob Mchangama and the Free To Choose Network have pulled off an amazing feat: they have produced a cool and measured documentary on a subject of great controversy. “Collision” is a poignant defense of free speech, and has a remarkable ability to find the seam between the right to free speech, and the sensibilities of religious believers. A remarkable voice, a presence on camera that is at once soothing and committed to the freedom of ideas." On October 31st, 2013, The Free Thinking Film Society will kick off its 4th Annual Film Festival to celebrate liberty, freedom and democracy. The Festival will feature four major events, two book launches, and over 20 films & events, between October 31st - November 3rd 2013 at Library and Archives Canada. There will also be a Free Thinking Alley where attendees can buy books and DVDs, and enjoy food & drink. "This year we pay particular attention to free speech," says Free Thinking Film President Fred Litwin. "Get ready for four days of challenging films and discussions with absolutely no political correctness." The Festival will feature four major events: On October 31st, the Festival will open with the film "Collision: Free Speech and Religion" followed by a panel discussion with Danish Human Rights lawyer Jacob Mchangama. 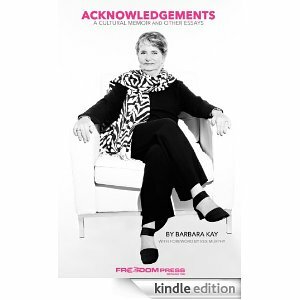 On November 1st, the Festival will present an evening with noted Canadian journalist Barbara Kay. On November 2nd, the topic will be China Cyber-Spying, first with a film and then a panel discussion, and the Festival will end with a very special evening on how Muslims, Jews & Christians work together in Uganda on a coffee coop. The head of the Ugandan Jewish community will be on hand for Q&A and coffee will be served. Other films include "Powerful as God," about systemic abuse within the Children's Aid Societies of Ontario; "Fracknation," presents the truth about fracking; "The Ambassador", a dark comedy that exposes the business of selling diplomatic titles, "Jihad in America: Grand Deception" about the Muslim Brotherhood in the US; "Transcending Fear: The Story Of Gao Zhisheng" about a Christian lawyer who challenges the Communist Party in China; "Changing Lives" a documentary about the impact of economic freedom; "The Sheik and I", about an independent film maker who tests the boundaries of free speech in the United Arab Emirates; "Broken Soldiers", a Canadian film on how our veterans struggle with PTSD and homelessness; "SARS: Coverup and Aftermath" on how the Chinese government covered up the true problems of the SARS epidemic. In addition, two authors will be in Ottawa to launch their books. Barbara Kay, columnist for the National Post will host an evening dedicated to her book, "Acknowledgements", and Elizabeth Nickson will present her book, "Eco-Fascists: How Radical Conservationists are Destroying Our Natural Heritage". Festival passes are available for $80 and can be purchased either online or at the following retailers - Compact Music (785 Bank, 206 Bank), and online here. Tickets will also be available at the door at the event. Day passes will also be available for sale. The Free Thinking Film Society was established in 2007 in Ottawa to provide an outlet for filmmakers and moviegoers alike who are looking for an alternative to the 'alternative'. In other words, we celebrate the efforts of risk-taking documentarians whose work espouses the values of limited, democratic government, free market economies, equality of opportunity rather than equality of result, and the dignity of the individual, all underscored by a healthy and patriotic respect for Western culture and traditions. Although there are a lot of courageous voices in the non-fiction film industry producing thoughtful pieces of art which reject cultural relativism, central economic planning and American culpability for all that ills the world, you wouldn't know it by looking at the listings for most art house cinemas. We're dedicated to changing that by bringing these exciting and challenging documentaries to Canada's capital.